St Patrick's Day marks the tenth anniversary of one of the worst days for the Irish Stock Exchange as the effects of the global financial crisis began to take hold here. 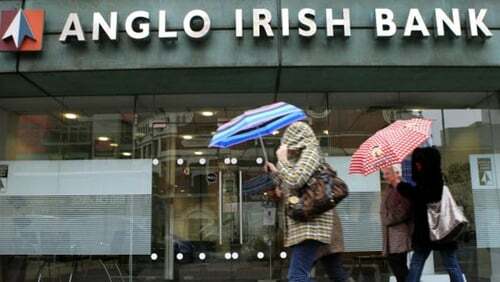 The event, which became known as the St Patrick's Day Massacre, saw €3.5 billion wiped off the value of stocks, with banks bearing the brunt of the losses - led by Anglo Irish Bank, which took a 15% hit. The slump followed the emergency sale the previous day in the US of investment bank Bear Sterns to rival JPMorgan. The move stunned Wall Street and spread panic that few banks - both in the US and here - were safe as a result of the sub-prime crisis. The major trigger of the financial crisis in the US was sub-prime mortgage lending. A sub-prime loan is one issued to a borrower with a poor credit history and would generally have relatively harsh terms, such as high interest rates or large monthly repayments. This massively increased the likelihood of such a mortgage falling into arrears and not being repaid, and the debt would become what we now know to be a bad loan. The economy here had clearly been slowing by St Patrick's Day 2008 and Irish banks' exposure to bad loans was rising. The country was facing into slowing growth rates and higher unemployment amid fears the US downturn could last considerably longer than expected. The catalyst of this one-day €3.5 billion drop - dubbed the St Patrick's Day massacre in economic circles - had unfolded the previous day on the other side of the Atlantic. Bear Sterns was an established pillar of the US investment-banking sector. It had been around for 85 years when in March 2008 its exposure to sub-prime lending finally caught up with it, and suddenly "the Bear" was in big trouble. Within a week, on 16 March, Bear's share price had collapsed from a high of more than $130 less than a year earlier, with JPMorgan acquiring its rival for just $2 a share. Bear lost $3.5 billion in market value that day alone. Maureen Mitchell, an Irish-American with more than 30 years' experience in financial services, was involved in asset management in Bear during its emergency sale to JPMorgan. She said there weren't many warning signals and when it happened it was "fast and furious". Maureen praises JPMorgan for its handling of the merger as Bear was "in many ways thrust upon" its rival. "Generally when you are in a transaction like that you get many months of being able to absorb a business - JPMorgan had to do it very quickly. "The Irish situation was almost like a microcosm of what would eventually happen in the US," she added. She said there had been signs of danger, adding that the real estate market had clearly reached its zenith and was beginning to wobble. "Growing defaults, particularly in the sub-prime market, were accelerating: early evidence of the wreckage to come." But it wasn't until Lehman brothers collapsed in September 2008 that "the bottom sort of fell out of things in the States", she added. Current Cantor Fitzgerald CEO Ronan Reid was head of another investment firm - Dolman Securities - during the crisis. He said he got a call in the afternoon of 16 March 2008 to say "that effectively Bear Sterns was going to go. We had heard rumours on and off. "Word came out of the US and we saw the collapse of markets as a consequence. Replaying those days, they were one of the many days that you say at the time signalled a lot of change going forward. "People immediately turned to who is exposed in your own market and Anglo would clearly have been the bank perceived - as well as AIB - at the time. Professor of International Finance an Commodities at Trinity College Dublin Brian Lucey said it was "not just a speculative rout, it was a fundamental sell-off of the banking sector". The Professor said the St Patrick's Day Massacre on the markets was "at the end of a falling trend for the banks. It was the capitulation phase of the bursting of the banking bubble, although they did have quite a bit further to go". He added that most Irish people did not realise until later in the year how bad it would get. The Irish market's plunge was in tandem with falls across Europe, Asia and the US. As most will know, the situation only worsened for the Irish economy following on from the St Patrick's Day Massacre, with the country still addressing many of the legacy issues the financial crisis left in its wake to this day. On the legacy issues of the crisis, Maureen Mitchell says where it has had "the most impact is an enhanced focus on governance and risk oversight, with a good deal of emphasis on this at the Board level". "I believe this focus on governance has in turn led to examining board effectiveness, and the importance of diversity in effective decision-making. And all of this has shone a light on building diverse boards, and is helping women gain a small foothold in this arena," she stated. But for a new generation, knowledge of these events a decade ago is not even a distant memory, according to Brian Lucey. "One of the interesting issues to remember is that if you are teaching a group of third year students, as I was last week, about financial crashes and bubbles, and you're referring to the St Patrick's Day Massacre and the collapse of the Irish banks, when it happened these kids were ten years old and they were playing with transformers. "For them it's ancient history," he added.